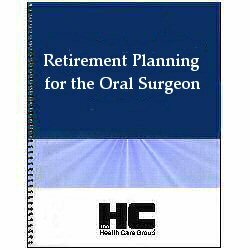 Retirement Planning for the Oral Surgeon can make this simple and uncomplicated. This comprehensive publication addresses all issues from retirement, estate, and pension plans to buy-ins and pay-outs, including all ethical issues of practice closure. Sample letters are included for announcing a partnership, to announce a physician's retirement, for notification of an oral surgeon's death, and for oral surgeons who are discontinuing their practice.